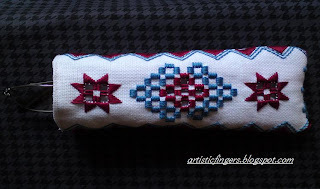 Do you know this stitch? This image is from my stitch sampler which I'd made long time back(20 odd years).It was my 1st attempt. 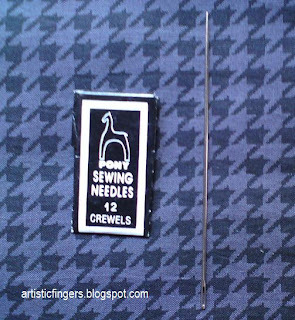 I'm posting this because I haven't seen this stitch in dictionaries/magazines/books. 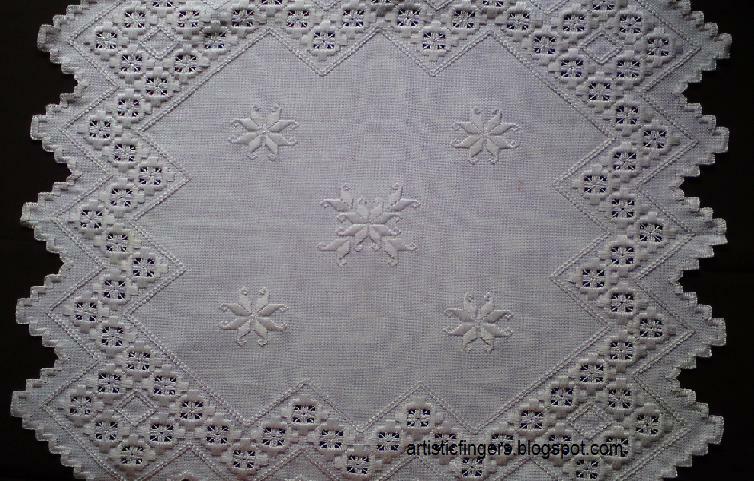 I'm not writing the name of the stitch here , I want you to guess.If this stitch is popular in your country please let me know . 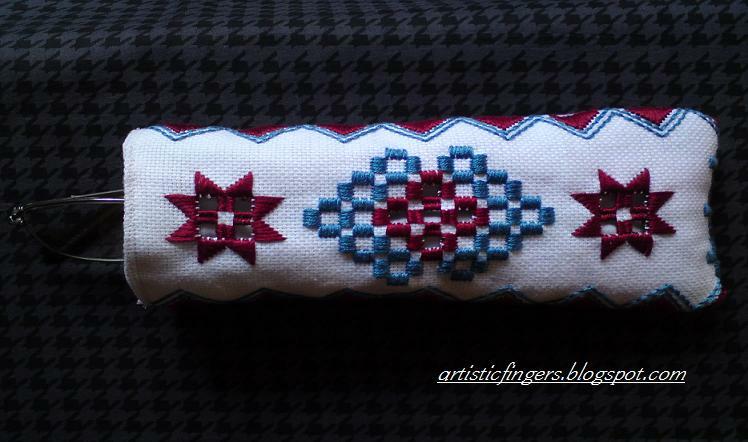 I want to add some stitch tutorial of not so popular stitches.What do you all think? 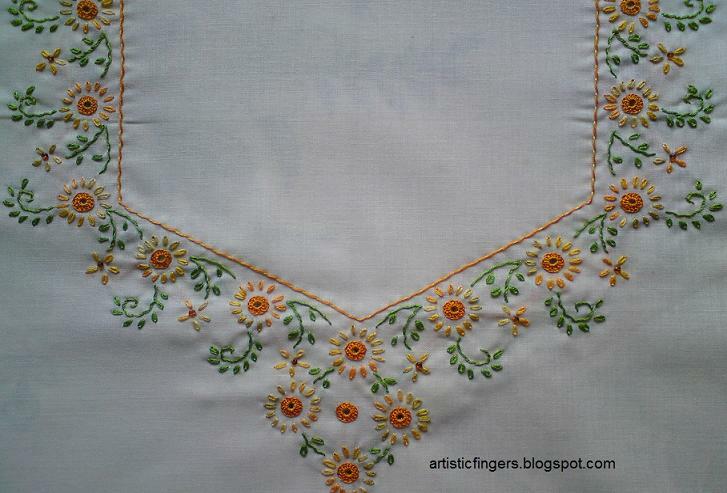 I'd done this shisha /mirror embroidery on a peach cotton fabric .Its a kameez/kurti . 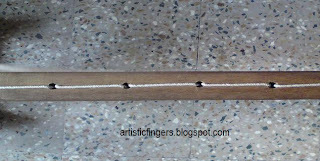 The orange circle in the center is the mirror. 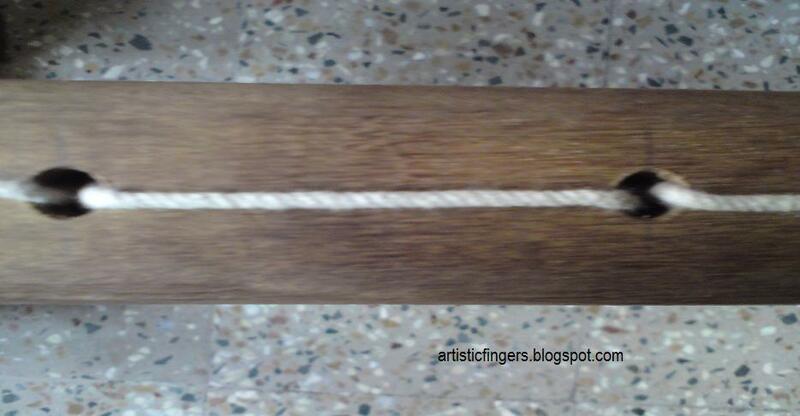 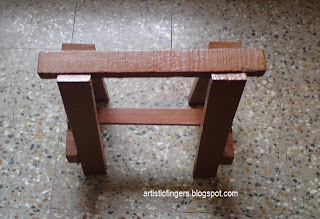 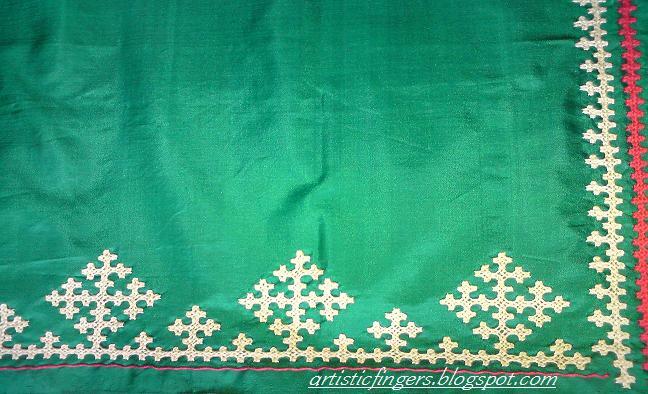 This post is about aari embroidery frame. 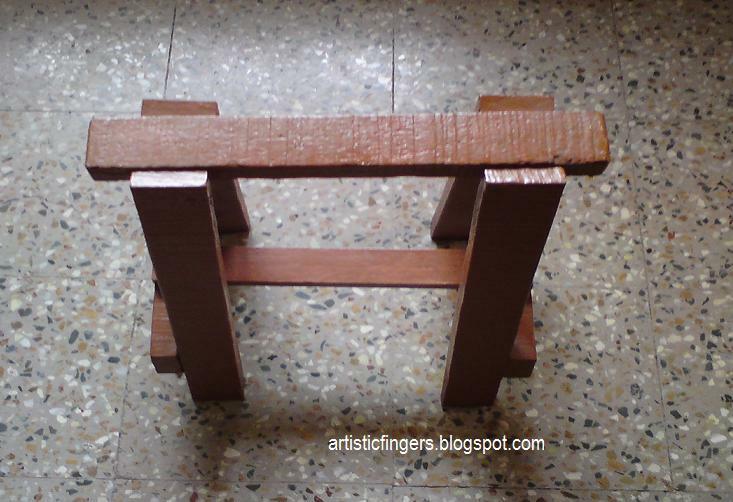 It has 4 stands,2 main bars and 2 side bars. 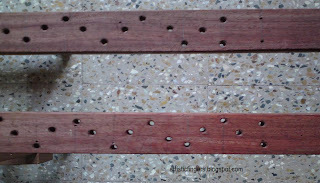 It is similar to slate frames. 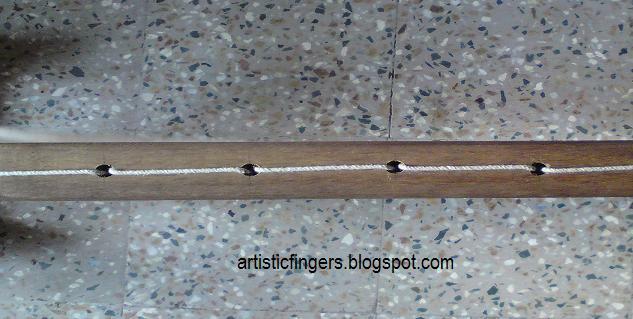 The main bar has got evenly placed holes,through which a thick cotton rope is passed twice.A strip of cotton cloth is attached to one side of the main bar(last image). 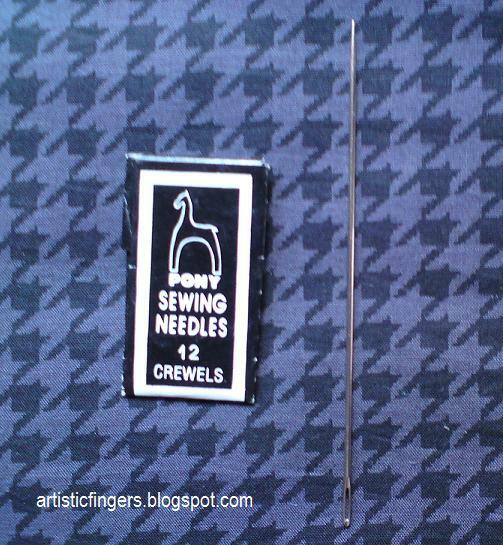 We've got to sit on the floor to work. 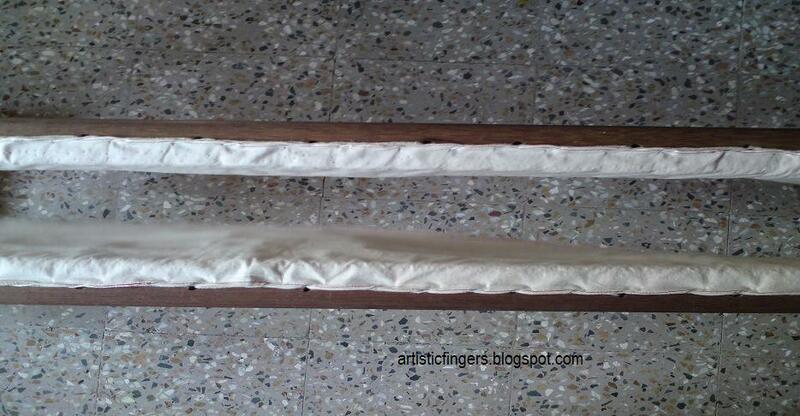 My next post in this series will be about attaching the fabric to the frame. 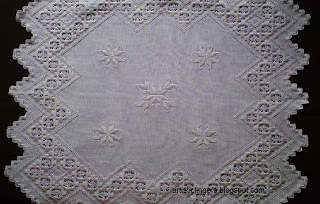 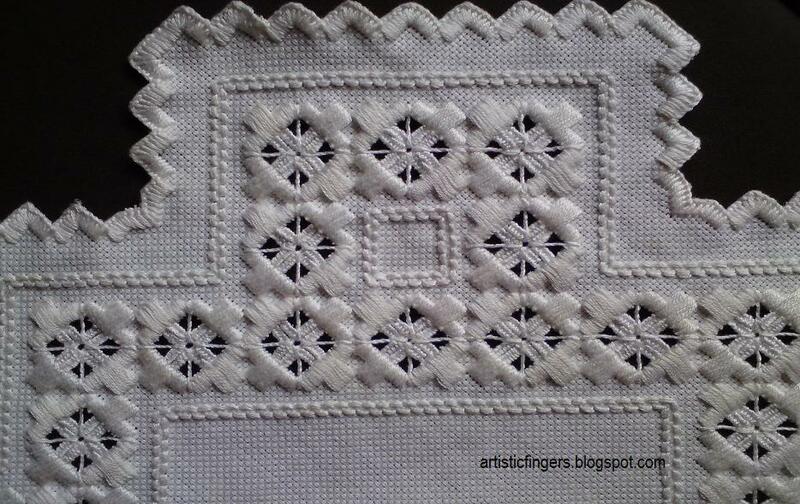 I'd like to share some images of a hardanger doily. 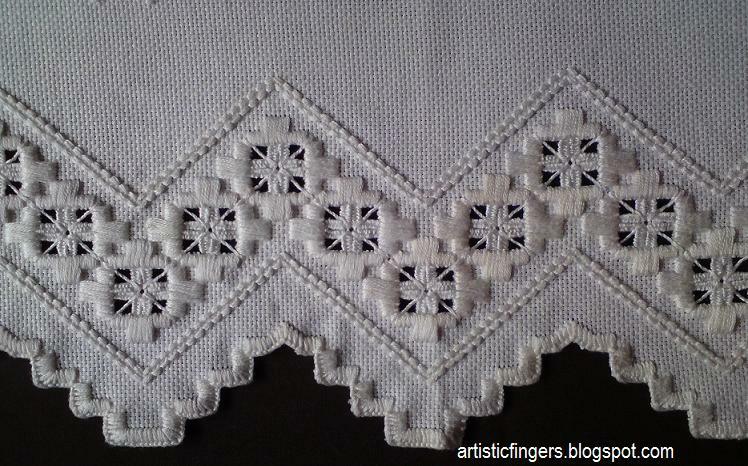 This doily was designed by Gina Marion. 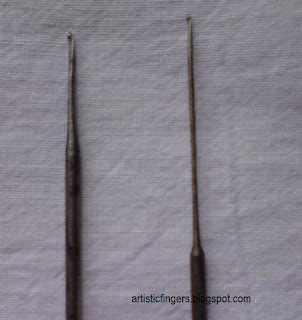 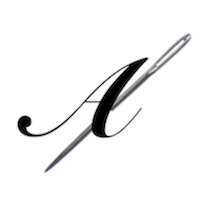 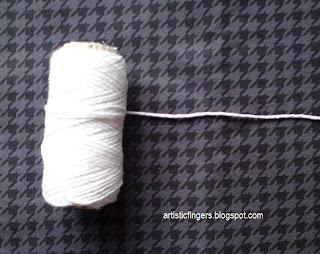 One of my reader had asked me how to prevent rusting in aari needles .oops!I should have written about that.I always coat the hook part with bee's wax.Before using wipe it thoroughly with a tissue or soft cloth. Avoid using heavy textured fabric ,smocked fabric and crushed fabric. 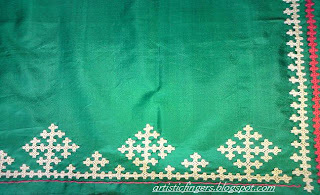 Heavy embroidery is usually done on silk and crepe sarees. I'll be posting about aari embroidery which is also known as tambour embroidery in some countries for few weeks from now. 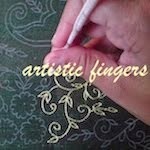 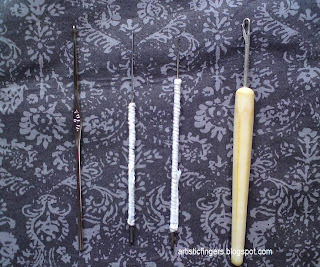 In this post let me explain about the needles and threads used in this technique. 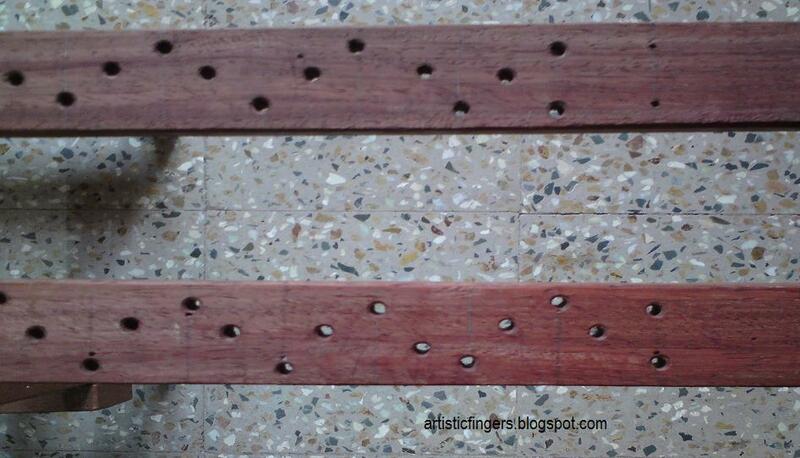 1.These aari hooks are made of iron. 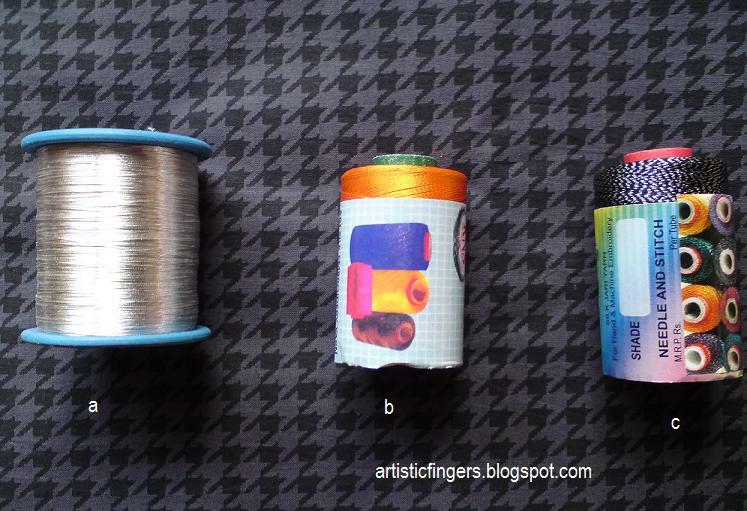 4.They'll not spoil the silk threads because they are filed properly. 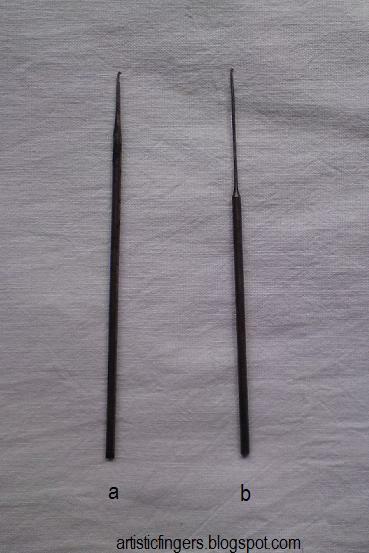 6.Many people think that these are crochet hooks but it's not. 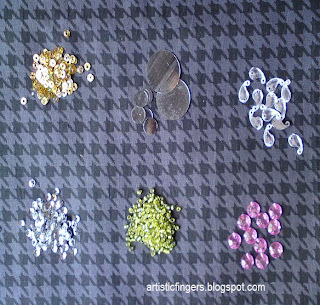 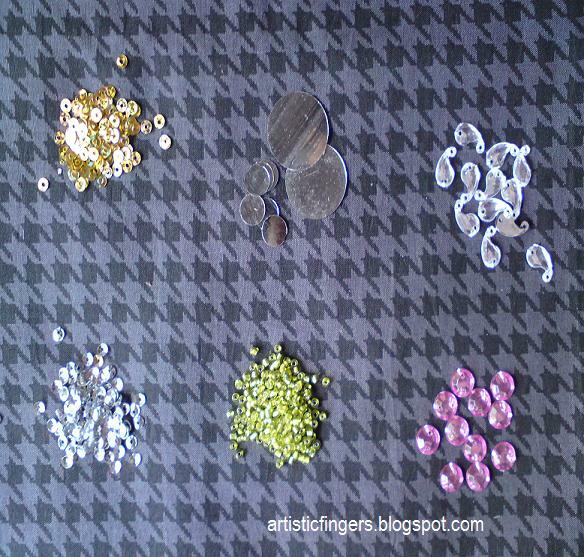 b. hook used to stitch sequins,beads. 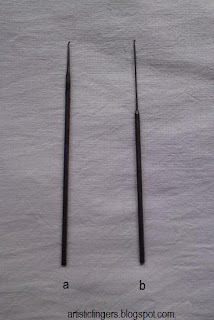 Note: hook b has a longer stem. 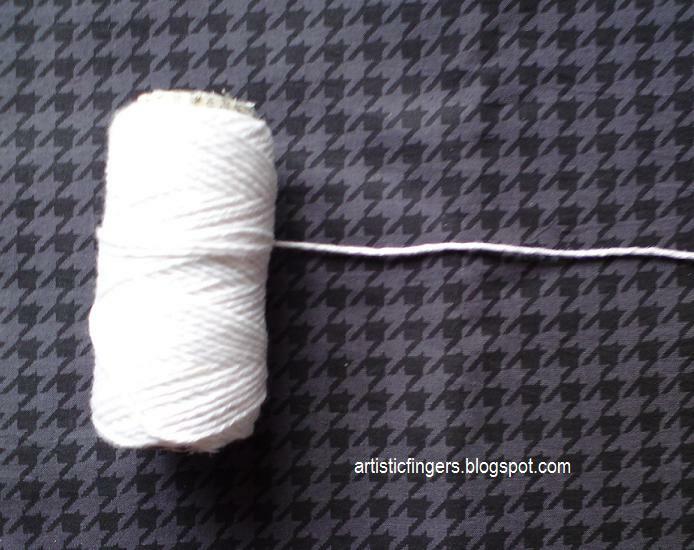 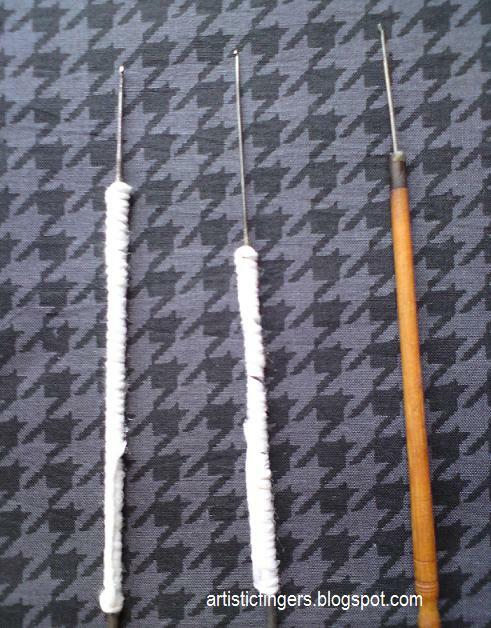 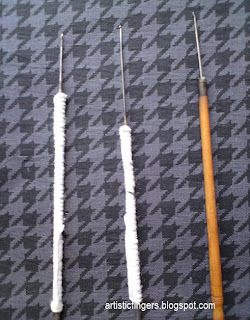 In this image I'd kept a crochet needle first and a latch hook at the end just to show you all the difference between aari needle/hook and crochet,latch hook.For an extra grip,cotton thread is glued to the needle. 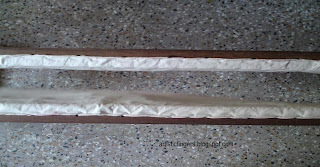 Mostly silk threads ,metallic threads(known as zari here),Silk Zari threads are used. 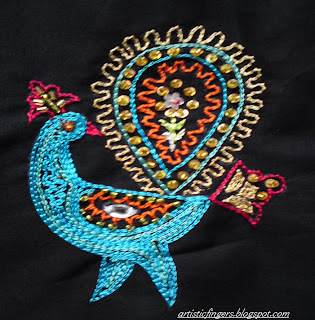 Aari embroidery is one of the popular embroidery styles in India.Silk threads and zari are used.It's done using a big slate frame (kind of) and the hook used is handmade.I'll post pictures soon. 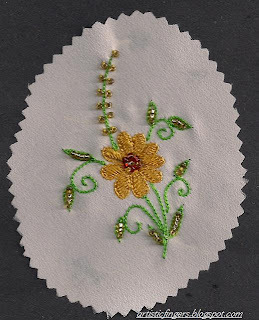 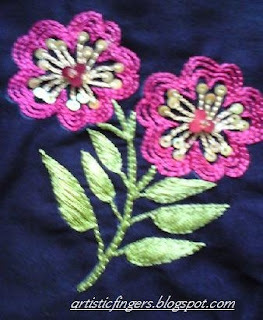 Cutwork,openwork,applique,filling stitches can be done with the same hook.Also sequins,mirrors,beads can be fixed too. 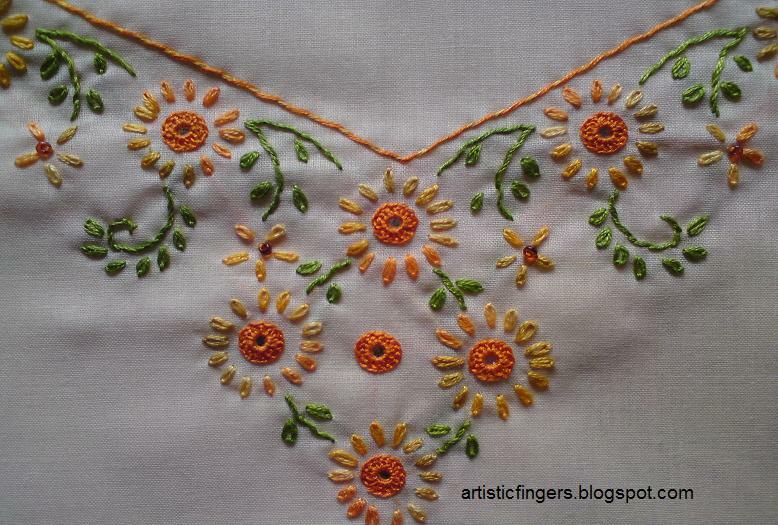 I'm posting images of my aari embroidery samplers which I'd worked long time back. 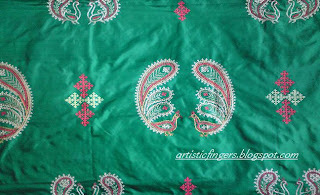 I will post more details about aari embroidery soon. 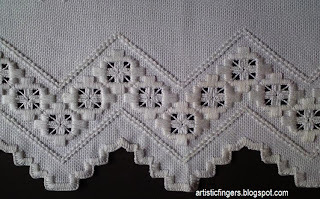 Thank you for visiting.Come back to learn more.Feel free to comment or mail me . 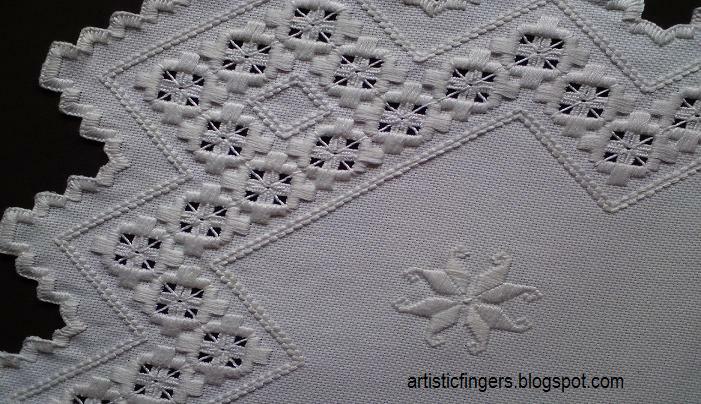 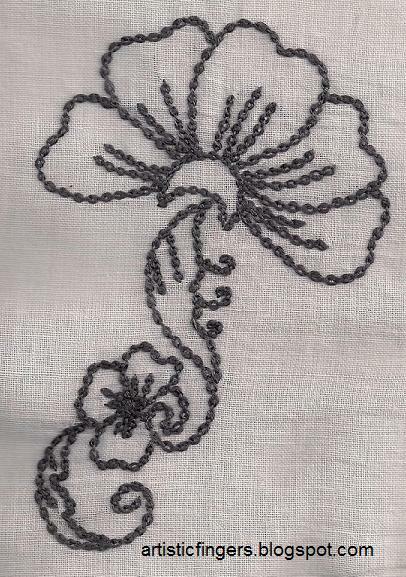 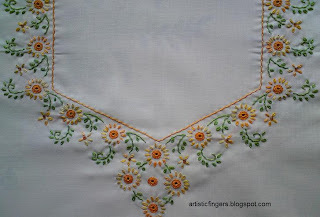 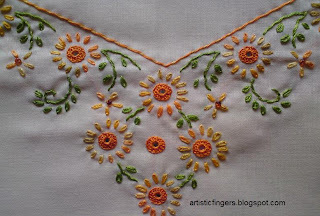 Hardanger embroidery is one of my favourite form of embroidery which belongs to the counted thread category,was designed during late seventeenth century . 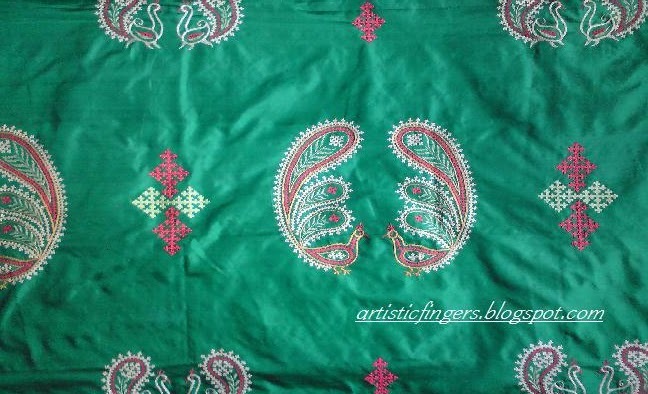 Kutch embroidery on a green silk saree. 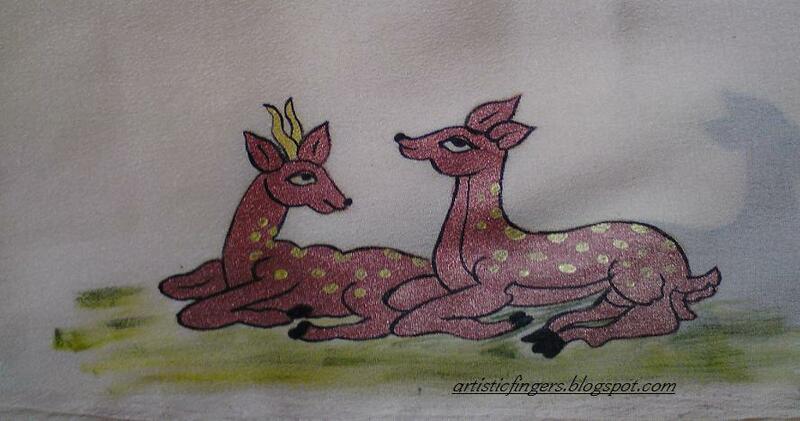 I'd hand painted this design on a peach colour crepe silk saree using acrylic paints and pearl metallic paints for Mrs.Selvi ,a banker .There are 30 motifs in the saree and 2 motifs in the blouse.